(Nanowerk Spotlight) Friction is present in numerous physical phenomena occurring at all length scales. In many cases, it is exploited to improve our life (you couldn't walk, drive or even write if there was no friction at all); but on the other hand, a reduction of friction is required to reduce mechanical energy dissipation and wear. About 1/3 of the world’s primary energy is dissipated in mechanical friction and 80% of machinery components' failure is caused by wear. Friction and wear will also become bottlenecks for micro-/nano-mechanical systems (MEMS and NEMS) featured with sliding components. Superlubricity, a phenomenon where the friction almost vanishes between two solid surfaces, will be the key to solve these problems. To date, most of the superlubricity observed was realized at the nanoscale and under extreme conditions like high vacuum or by using repulsive van der Waals forces (read more: "Slip sliding away in the nanoworld"). Recently, researchers demonstrated the practical utility of superlubricity on the microscopic scale ("Superlubricity can enable microscopic devices to move at speeds of up to 90km/h"). It was believed that macroscale superlubricity did not exist due to structural deformation of macroscale materials. Until now. In the November 3, 2013 online edition of Nature Nanotechnology ("Superlubricity in centimeters-long double-walled carbon nanotubes under ambient conditions"), Yingying Zhang, Fei Wei and colleagues from Tsinghua University and Peking University, report a breakthrough in macroscale superlubricity. The researchers demonstrate, for the first time, that superlubricity could exist in centimeter-long double-walled carbon nanotubes (DWCNTs) under ambient conditions. "The superlubricity scale was three orders higher than the values reported before, while the shear strength was four orders lower than that reported before," says Zhang. Double-walled carbon nanotubes – composed of two coaxial cylindrical walls with high aspect-ratio – offer a good candidate model to study superlubricity. The interaction between DWCNT shells is based on van der Waals forces, and the inner shells can slide or rotate inside DWCNTs. For most DWCNTs, the interfaces between the inner and outer shells are incommensurate, which means that the two surfaces have no energetically preferred position with respect to each other, and hence they can slide relatively to each other with no cost in energy. Furthermore, for an ideal DWCNT with a partly extruded inner shell, the shear stress in the overlapped section vanishes due to the repetitive breaking and reforming of van der Waals interaction between the adjacent shells. "Thus, only the edge section is responsible for the intershell interaction in DWCNTs during the pulling out process," explains Zhang. "The friction between the two shells of a DWCNT is independent of its length. Therefore, a centimeter-long DWCNT – on the condition that it has perfect structures and is without obvious axial curvatures – can exhibit superlubricity." During the past few years, Prof. Fei Wei and his team from Tsinghua University made several breakthroughs in synthesizing centimeters long double-/triple-walled CNTs with prefect structures (see these papers in Advanced Materials here "100 mm Long, Semiconducting Triple-Walled Carbon Nanotubes" and here "Superstrong Ultralong Carbon Nanotubes for Mechanical Energy Storage" and in Chemistry of Materials here: " Growing 20 cm Long DWNTs/TWNTs at a Rapid Growth Rate of 80-90 µm/s"). These nanotubes are perfect candidates to explore the macroscale superlubricity of DWCNTs. 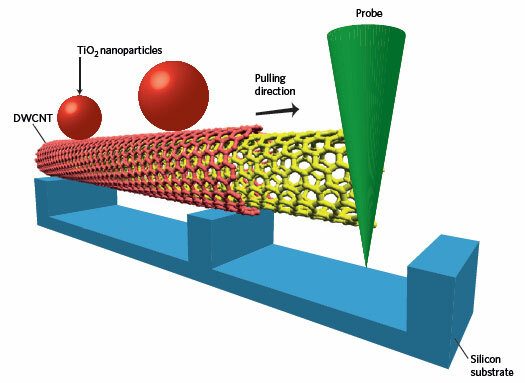 In order to perform measurements for such extensive range of length scales (from few nanometers to a centimeter), the researchers coated the carbon nanotubes with microscale particles and used an optical microscope to analyze the frictional response (see our previous Nanowerk Spotlight: "Visualization and manipulation of carbon nanotubes under an optical microscope"). According to Zhang, the measured friction force between DWCNT shells was almost independent of the pull-out length and it could be as low as 1 nN. The resistant force exhibits only small fluctuations, about 2nN, around the average value of 3 nN for a huge range of contact lengths between the extracted inner tube and its outer host; the contact length changes by six orders of magnitude, from tens nanometers to few millimeters. "Our observations demonstrate that static friction at the incommensurate contact between the inner tube and its outer host is really negligible, ∼10 Pa, even for a centimeter long contact," she says. Prof. Michael Urbakh, who reviewed the findings ("Towards macroscale superlubricity") commented that "These encouraging results bridge the gap between what is known about friction on the microscopic and macroscopic scales. The observation of superlubricity in ultralong DWCNTs is a promising result for many practical applications, such as ultrasensitive sensors, fine positioning devices, gyroscopes, fast switches and more." The work is supported by the Foundation for the National Basic Research Program of China (2011CB932602, 2013CB934200) and the NSF of China (51372132, 60925003).